This blob has been on sabbatical. And so it is that Christmas and the New Year have come and gone and it is now all but February. The winter holidays hit the beginning of school like an ocean freighter that has forgotten to power down before nearing land. Few were ready for the rocky coastline of homework and pack lunches. The winter and spring breaks are simply ridiculously short, the summer one is immense and stretches like a desolate mirage across months of shimmering heat. President Obama, it is time to dispense with the Agrarian Calendar once and for all. I can testify that my children haven’t a clue about harvests and when presented with a single hour’s drive into the West Virginian countryside become wildly animated at having seen a cow – a blue cow – but give or take a little of imagination, it was rural and that thrilled enough. 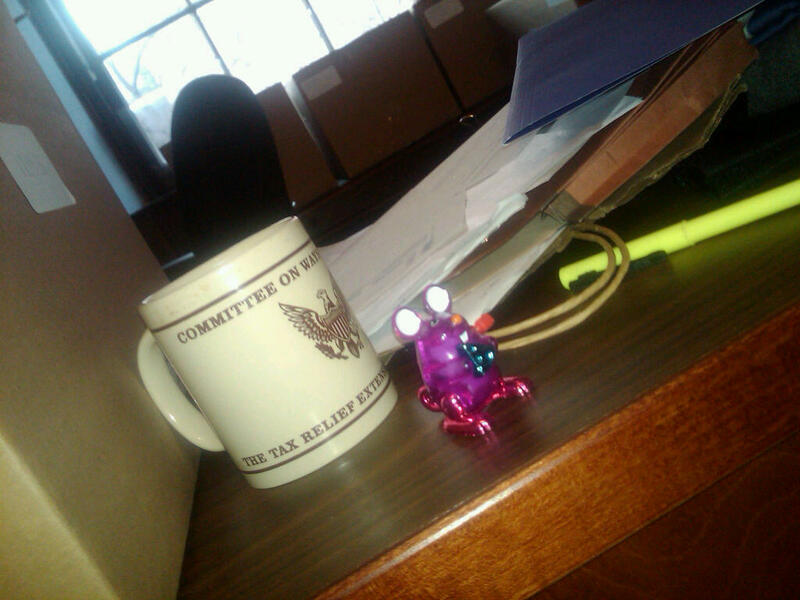 Since we collided with regular life, the Republicans have taken control of the House and the Congressional Clockwork Mouse has sent forlorn images from the Capitol of his packing boxes moving on to a smaller office to make way for the new majority. Possibly most importantly, however, the Winter Social is now a thing of the past. For those as interested in the Winter Social as in the Hoodie and Footie phenomenon, I can only say that it was a little bit of a disappointment. There were bowling shoes a plenty but the jugs of M&Ms, coconut or otherwise were missing from the collage of misery I portrayed. Some decent bottles of wine were smuggled in under the unsuspecting noses of the Bowling Alley staff, lights were dimmed and columns were wrapped in burlap, branches and fairly lights. An ipod somewhere blared out memorable songs from the 80s and 90s and so long as you avoided the deep fried mozzarella cheese sticks you were okay. I tried a second to verify that it was truly as disgusting as the first and that was my first – if relatively minor – mistake of the night. The event succeeded in raising three times more than was budgeted and the committee, still cannot work out quite why. There was something up that night with the Trout Tanks. It transpires that people were more willing to donate money for chilled trout than for any other living being at the school. The Chinese Acrobats plummeted by comparison and Brazilian Mime failed to drum up the clamour of their gilled adversaries. On top of this, one mother was heard to audibly declare that she did not want a cent of her contribution ending up in that ‘Community of Caring Crap’. One of the most memorable bids was made by to our local magician, world-wide conjuring expert and author on all things magical. With a starting bid of $340 for a series of 9 puddings/deserts to be delivered to his abode over a period of 9 months, he won. No rabbit out of a hat trick there. Then we had the ski chalet in Colorado which went for $1,500 and the on-the-edge-of-your seat, last minute bid for Botox. This item had been buzzed about by bidders like bees around a hive but most lacked the courage for final action. We all had lines of defense and self-mockery. My own angle was to have been that it was ‘a necessary part of my research into America”. Then we had the feverish desire of more than a 3rd of the guests to take part in a Toga Party this May – which much to my delight will be hosted opposite us. I cannot wait to watch it unfold, unwrap and generally come undone in the early hours and have offered my husband and self as serving cupids to get a closer take. The Toga party was prominently advertised by DJ SandCrab and his wife, both draped in sheets with real ivy wreaths about their heads. This I thought rather chic, no plastic conundrum there. Laurel is hard to find and ivy a perfectly acceptable alternative. It was strangely not this pair who were hauled over by the police in the wee hours, nor was it a figure, who shall remain nameless, who swayed up to me with a half drunk bottle in each hand. It was not even the person who downed the posh tequila that had been used as a prop to advertise a backyard pub crawl. Nor the illicit member who actually quaffed the contents of the artisan beer basket that had already come under the hammer and was destined for better places. It was muggins. Muggins who was myopically trying to find a way out of the naval base while conveying a dear neighbour, a figure of rectitude, and failed to see a darned STOP sign. Not a stop sign at an intersection where one might naturally ease to halt and check for the threat of oncoming traffic (even in the early hours of the morning on a completely deserted naval base) but a STOP sign that could only possibly serve some purpose during the day when it might allow construction vehicles to make their muddy way onto the thoroughfare of life. The cops were onto me, blue and red flashing lights. Did I stop? Hell no. It did not occur to me that I had done anything wrong. I carried on conveying my passenger at a very sedate pace towards the guards at the exit. A light blared through my rear window and I wondered what sort of strange Naval emergency vehicle was tailing me. I was finally corralled to the curb and a megaphone ordered me to ‘puulll overrr”. I put my hands resolutely on the top of the wheel to show I was not trying to pull out a gun – it was like a movie. Had I seen the stop sign – I did not think so, I responded flimsily. I was given some minute instructions as to how to drive my car into an adjacent lot. I pulled up and attempted to get out of my car, our first initial encounter being over this seemed only respectful. “Stayy in yuur carrr” came the megaphone again. Shaken I clasped the wheel to demonstrate my innocence. I attempted to explain the circumstance of the evening and was told “Now you listen to me”. Eventually I was let off with a caution. My scrupulous companion concluded with a “Have a good evening officer”. He demanded to know what she had said. Too exhausted from our fundraising activities she had forgotten so I weakly relayed “She said ‘have a good evening’” His bristling frame relaxed an iota and issued even more minute directions as to how to fasten a safety belt, drive a car and exit a parking lot. I followed these to a tee, driving bravely but obediently into the security gate channel for oncoming traffic and had to be asked to reverse by two incredulous marines. So what is it with DC and STOP signs? A British cop we know thinks it stems from a democratic desire to remind citizens that they are all equal. My husband believes it results from the confluence of different cultures where no one mode of conduct is know to all, hence the requirement for a hard and fast rule every hundred yards. Probably getting a Frenchman called ‘the kid’ to design your city has not helped. The grid pattern is unyieldingly egalitarian. No one street grows organically to gain supremacy over its peer. Maybe the rest of the US is similarly affected, but all I know is DC is riddled with them. Driving through DC is like dictating a telegram. My first experience of this phenomenon was when a realtor took us on a tour of North West DC and pulled his gigantic pick-up to a perfect halt at each and every intersection. He also insisted on calling Maryland, not Mary Land but something more like Marilyn. It was unnerving. I have since come to think that this extraordinary phenomenon could only have been bred and allowed to flourish in a country where petrol costs almost nothing. I have speculated that oil lobbyists have petitioned for this as I can think of nothing more inefficient than coming to a complete halt at the end of each and every street. Muggins has to admit to having shot several STOP signs with steady deliberation, once with a member of the Winter Social committee, much to her amazement. We were in one of those recent suburbs where modern homes have plummeted to the ground like cardboard boxes along a ribbon of asphalt, a bleak expanse where no shrub has had the chance to shade the embarrassment of uninterrupted grass attempting to mask the newness of it all. I could see for yards and yards, there was nothing – why on earth would one stop? It did not occur to me that it was even expected of me. In DC the most prevalent breed of STOP sign is the four way STOP sign, calling for all traffic at a cross road to come to a complete standstill. 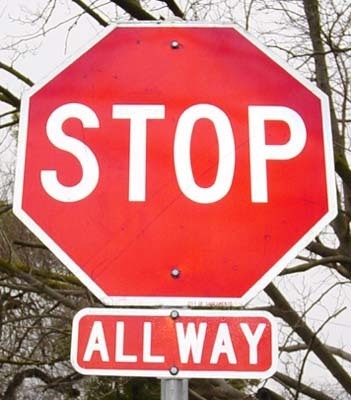 Almost invariably everyone has a stop sign, unless… it is one of the exceptions. In these cases you are in for a nasty surprise. You may have come obediently to a halt and be about to rev up your engine, in the expectation that the other car is your democratic equal and holds the same level of obedience, when it blasts past you narrowly missing your whiskers. In order to preserve your whiskers, bumpers, life and sanity what one is actually called upon to do is to perform a strange neck craning activity. This involves scanning the perpendicular street for the tell-tale grey octagonal form of the back of a STOP sign and only then can one proceed with confidence. Occasionally the STOP signs have a little post script underneath with the words “All Way”. For a long time I thought this was a personal exhortation for those with a deviant foreign mind to stop entirely but now I understand it is designed to inform you that everyone is required to stop. As these post scripts are used scantily and at the whim of the street maintenance man, to rely on them would be insane. As a result the only safe way of proceeding is to stop, perform the peculiar neck craning activity and only advance if all seems safe. Whilst the egalitarian theory and confluence of cultures hypothesis have their merit, I tend to hold fast to the petroleum argument along with the fact that road markings (Westmoreland circle is a case in point) and signals are just a nightmare together with the US electricity grid which hangs perilously amongst the trees. For example, why is a stop light/traffic light actually on the far side of the intersection? It is telling you to stop before you even get there. It is engendering Stop-Neurosis. More worryingly though, I fear that the STOP sign has become so morphed into the US consciousness that it has spun its way into every aspect of our lives. Mothers tell their children not to toboggan onto a snow covered road – not because there is any likelihood of traffic thundering through but just because… well because, heck who knows? Just stop. The Representatives and Senators we have voted in are hardly getting stuck into all their promises before they stop again to get re-elected and no one bats an eyelid. Well actually someone does. The clockwork mouse has also had his fill of watching things stop and start on the Hill. The Health Care Bill, that eventually navigated its way through an entire neighbourhood of neurotic STOP signs to emerge an emaciated shadow of its former self, is now in the dock and has been stopped. Stopping things, it seems, has become each and every man’s prerogative, no matter how illogical, pointless or even costly. It is high time to start the revolt, to run through stop signs and chant incantations at traffic lights and make them turn green. This entry was posted in Quill & Ink: Scrolls and tagged School fundraisers, Stop signs, Traffic signs, Washington DC. Bookmark the permalink. I enjoy reading your post about your adventures on the road. You write it with sharp observations, captivating suspense and as an invitation to look further. Your perceptions about street signs and the citizens behavior opened my mind. I agree that the STOP neurosis is pervasive and appears very often in our everyday life without even being aware of that. I would like to add that is easy to find a comfortable zone and STOP moving ourselves beyond. Sometimes we let others to establish our own limits. Your post is extremely fun too. I have never thought before that driving through DC is like dictating a telegram, or that this STOP signs are there to let us think that we are all equals. Anyway, I am lucky to be just a pedestrian who doesn’t have to look the STOP sign at every corner. Please, don’t STOP writing your blog. That was I think my favourite posting ever. (: As a native Marylander / DC’er, I am so used to seeing red STOPs at each corner, along with triangular YIELDs and the rectangular ONE WAYs that I hardly ever think about it. I suppose that all the geometric figures are designed to decorate the road or even avoid confusion (which goodness knows there is plenty of) but it is very refreshing to hear your point of view on them, also the waste of gas and the perils of street crossing. I also laughed about the police encounter, it is another sort of hapless confusion that would only happen in such a convoluted place as a naval base. Bravo for you for sticking it out. Mum was quite impressed! Lastly, I was so glad to hear that the PTA was successful. You guys spent a lot of time + effort, you deserved every penny! Will you be joining the toga party? I don’t think we will be attending but it sounded very original. Sounds like an interesting night if not a fun one.